The conference FutureDesignDays RAW IDEAS at Gotland has its basis in the raw materials industry (e.g. wood, water, limestone and mineral) in the Baltic region, and the industry’s potential future from a design-, business- and sustainability perspective. It is a meeting-place where politicians, entrepreneurs, manufacturers, designers and visionaries, can broaden their network, collaborate and develop innovative processes. The purpose is a discussion about the possibility to increase the degree of refinement of our national raw materials, and also our basic industry’s competiveness through increased design competence. The next meeting for RAW IDEAS is Almedalen 2010. FutureDesignDays RAW IDEAS is organised by FutureLab and GRASP RAW. Gotland’s University, SIDA and Tillväxt Gotland (‘Gotland Growth’) are partners. What are the new ways to refine raw materials? What are the most sustainable applications? Which are the success stories to learn from? Who runs and who influences the development? What innovations can we expect in five to ten years from now? What challenges do we meet, recession or not? The programme included Astrid Renata van Veen, architect from Snøhetta, Norway; Jutta Telivuo, architect from Graphic Concrete, Finland; Erik Schedin, Design & Fabrication at Avesta Research Center Outokumpu, Sweden; and Stina Lindholm from Skulpturfabriken, Sweden. Moderator for FutureDesignDays RAW IDEAS was Rasmus Wærn, architect at Wingårdhs and teacher in the history of architecture at KTH Royal Institute of Technology. Renowned design- and architecture writers Rebecka Tarschys and Karin Winter visited Gotland and RAW IDEAS, where they were given an opportunity to study an important industry that few understands completely. The champagne was delivered by Norwegian Astrid Renata van Veen, from the architect’s office Snøhetta; Scandinavia’s most successful savages with the library in Alexandria and the new opera house in Oslo as their most talked-about work so far. Here she spoke about their winning relations with the Arab world, which have given them carte blanche to far-reaching development of materials and methods. The development of concrete applications is established. Architect Jutta Telivuo from Finnish Graphic Concrete, showed her graphical décor at concrete units. She maintained this to be a way to bring out the material’s inherent possibilities. The stone ballast always has a colour, maybe a soul. 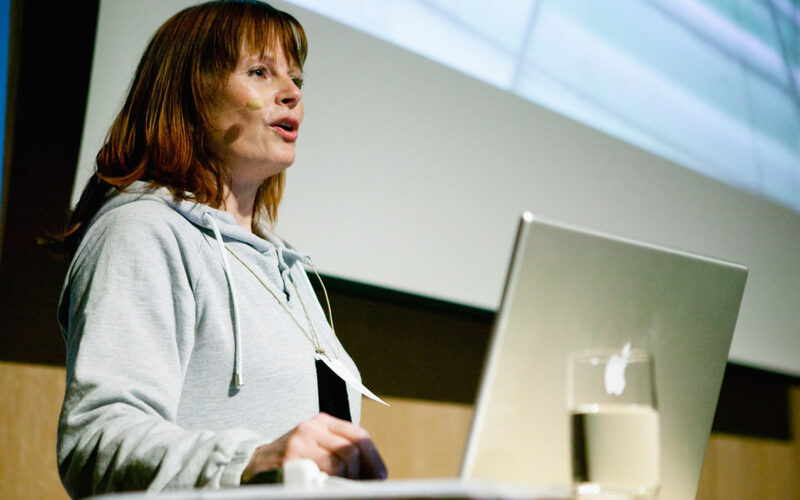 Gotland’s answer to the concrete possibilities was formulated by Finnish Stina Lindholm’s talk “The Untattooed concrete”. She rather listens to the unpredictable material. And, as she said, greyness is the best in concrete. The result of her twenty years at the island is a variety of refined saleable products. With her realistic attitude, she winded up the afternoon’s inspirational talks. The core of the programme was the discussions that followed in the three material cubes named: What Gotland has to offer and to which markets? How to produce more? How can we bridge the gap between production and design? The questions were asked by the organisation Tillväxt Gotland (‘Gotland Growth’) and discussed by design students from Gotland’s University, divided in groups that gathered in the LEVA-house. Henrik Bergqvist, consultant from Department of Doing, sent the applicable global concepts ‘raw material industry in the world’, ‘refining companies’, ‘added values through quality and design’ and ‘sustainable development’, with us. He hoped for the ‘free conversations’ to develop in ‘open space’. We were encouraged to vote with the feet, or in other words, we had green light to move on the next group at any time. But we almost got caught in the concrete cube, where the conversation dealt with Gotland’s possible supply and the available subsidies. The originator of the cube, Robert Segerdahl with the business idea ‘The most energy-saving house construction in the country’, was really stuck in a vice between mainland municipalities ready to provide capital and move its business, and the lack of encouragement from his home municipality (Gotland). His idea is based on French plate panels loaded with mineral wool. Why can’t Gotlandic wool be used as insulation instead? Must all marketing subsidies go to Tourist Gotland? Johan Hellström, founder of Furillen, decapitated the short-viewed Gotlandic perspective in his constant combat for expansion. The wood cube, where ‘more’ was the challenge – or problem – set its hope to a new environmental-friendly wood preservative, developed at Gotland. In the summing-up, Henrik Bergqvist and his growth pack, kept to general terms without mentioning the emotionally charged, specific problems that were debated earlier. The students’ report carried the surprising and urging message that Gotland’s raw materials still aren’t among the courses offered at the university college’s design education. Give us a concrete island between Gotland and the mainland, and we will show the possibilities, promised the female student who summed up the three reports. We will invite entrepreneurs and designers to our workshops at the island. More promptly, she and her friends hoped for support to exhibit ideas and products in Gotland University’s stand at Stockholm Furniture Fair in February. Rebecka Tarschys’ and Karin Winter’s summarised notes and impressions at the ferry from Gotland to Nynäshamn, happy also with the stringency that surrounded the conference. From the nametags on black felt and the thoughtful access to fruit and tea in the LEVA-house and the house-cubes, to the nice gathering dinner. Lamb melting on your tongue and roasted potatoes and beetroot with chèvre. Along with chocolate truffle served on the whitest of limestone tiles from Slite – easily slipped into the pocket. GRASP RAW are Helena Bloom, Barbro Lomakka, Karin Kloth and Mait Juhlin. Living Ecological Visionary Architecture – founded in 2009 by Helena Bloom and Susanne Liljenberg (one of the founders of Granit), in cooperation with constructional engineer Pernilla Öfvergård. Next year they will open a new meeting-place in Kungsladorna (an area in Visby) along Klintehamnsvägen. The business idea is prefabricated ecological houses.